Finally got the film from the Kodak Film Wake that Andy had organized a couple of weeks ago scanned - here's our neighborhood in black & white & fisheye. PS - like music? Check out Andy's Audio Blog! PPS - click on any of the photos for a slideshow view with larger shots - there's no more to read, I didn't do captions we just took a walk around Ditmas Park. Ah, Boating Local has one of those insta-post thingies. How lazy can I get! Anyways, for anyone who's really getting itchy for some paddling but hasn't got the right gear for the spring water temperatures, here's a fun & educational option for Saturday. See you there? A little off-topic for this blog, but just can't resist a quick plug for a play by a fellow paddler who turns out to be an amazing playwright. I always enjoy finding out the real-life talents of people I've enjoyed spending time with on the water - this one sort of blew me away and I'm very, very glad that things worked out that in this crazy work week I actually did get a night where I got out early enough to see it. Big thanks to Sebago's own lovely Laurie Pea, outreach coordinator for the play, for outreaching me right into that front-row seat. Wow. If you live in New York, and you enjoy theater, I can't recommend the play I saw tonight enough. 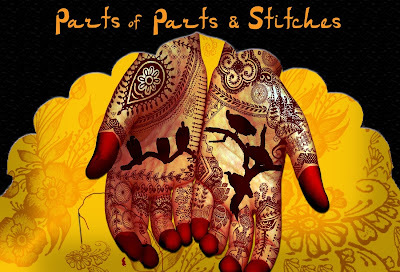 Parts of Parts and Stitches was amazing - Riti Sachdevi took the time of the partition of India (which I now feel I should learn more about - I knew that there was violence at the time that has reverberations to this day, but I just wasn't aware of how terrible things were) and creates an absolutely mythological story of people's responses. The chorus of vultures is particularly chilling - mob mentality personified, goading various characters to greater and greater acts of hatred, feasting on the leavings - horrifying because it's so easy to picture them hovering in the background in so many stories we have in the news these days, both here at home and abroad. Only running 3 more days. Worth catching if you can. Click here for details, or here to read a more formal review. Perfect First Weekend of Spring - Part 2: Ahh, Dirt. I was being overly optimistic. I'd been THINKING about taking advantage of the good weather to get going in the garden. In the meantime, the weeds hadn't been thinking - they'd been doing. It wasn't ALL bad. Along with the daffodils and the onions, I'd left the chard roots in because with the warm winter, they'd never entirely quit producing. The last serious picking had been in December, when I'd pretty much plucked 'em bare thinking that eventually we might get winter - but I never got around to pulling them up. I got a decent little bag of greens off of them before I pulled them up. Bagged all the onion flowers too, they're just buds right now and I thought maybe I would throw them in with the lamb shanks I plan to braise one of these days when I have a little time to cook. Just an experiment, y'know? The chard, I took over to TQ's in the evening - he was making dinner, I didn't have quite enough for both of us, but he sauteed what I had up and added it to some pink beans he'd already made as a side dish & it came out very well. Mostly, though, it was weeds, especially this purple stuff that proves the adage about a weed just being a plant that's growing somewhere somebody doesn't want it. Pretty little flowers, aren't they? If they were down at the other end of the lawn by the kayak racks, yeah! Up here in the garden? AIEEEE! What IS that creeping purple crud??? There are 2 beds adjacent to mine - can you see them? So I got going on reclaiming my plot from all the encroachers. The purple crud, the green crap, the dandelions, the grass, the mint...oh, the mint, I don't mind a little mint growing nearby, but the stuff was coming in thick and I ended digging down under the sprigs and pulling out yard-long runners. Three hours later - hooray! I win! Yes, I'd reclaimed the bed - but I was out of time, and out of gas. Planting? Nope, just put the "cat discouragers" in place, packed up my pickings and my seeds and headed back to Midwood. Can't resist closing with a gratuitous Glenwood Avenue parakeet shot. Stopped to watch them for a little while on my way to the club - I'd just missed a bus so I had a little time to watch the birdies. Perfect First Weekend of Spring Part One - Ahh, Salt Water. Oh, how I'd been looking forward to last weekend. That it was the first weekend of Spring was nice - but more than that, it was the first weekend in WEEKS where I didn't have any particular responsibilities or prearranged plans and could just go with whatever whim and weather said to do. I said on Friday that I hoped to smell of either saltwater or dirt or if possible both before the end of the weekend - I actually managed both and it was maaaahvelous, absolutely maaahvelous! Oops. Well, maybe it was a little soon for the flip flops. Anyways, according to the Pentax info, that was February 18th, so by last weekend, as I said, TQ & I were just itching to get in a good paddle. TQ was still sort of leaning towards sailing, but as the weekend approached, the windspeed forecasts started getting revised in an upward direction, and when we finally checked on Saturday morning, iWindsurf was showing gusts in the 20's. And that's exactly what we found out there and we were glad we'd chosen kayaks, which we're both able to handle much better than sailboats when there's a blow. This was definitely not a first-sail-of-the-season day. We both had a couple of things to do (he had to take a delivery, I wanted to stop at Dragonetti's for compost on the way to the club) so we didn't get to the club until around 2:30. We'd originally talked about going to the Marine Park Bridge (a nice afternoon's paddle) but we changed our plans when we got out of the basin & found exactly what we'd seen on iWindsurf in the morning. Steady 15 kts, gusting to quite a bit more, and from the southeast. We decided to do a straight shot to Ruffle Bar. That put us heading straight into the wind and meant fun potential for a good surf-driven scoot home when we turned around. It was a heck of a workout getting there. We forgot to time it but estimating things later, we think it probably took us an hour and a half to travel the 3 miles there. TQ decided to stop for a bit of a break when we got there. I joined him. After clawing our way over there, it actually felt really good to get out of the boats. The sun had come out, it was very pleasant onshore, and so instead of going around the island in our boats, we decided we wanted to walk around. We brought our boats up to the high-water mark (we were past low water and on the gently sloping shores we have in the bay, a rising tide can eat up a beach with surprising speed) and set off. I think it's a lump of coal, but look how pretty! I try to restrain myself while beachcombing these days, there's a very satisfying collection of treasures on the windowsill in the kitchen where I keep most of my finds, but I'll still pick things up if they are a nice color or a possibly identifiable antique. It's not the value (I could probably get a couple of bucks for the best ones I have, but not enough to make me want to sell), it's the fun of coming home and looking online to see what I can learn about the bottler. In this case, the Milk of Magnesia bottle was a neat find - the embossing on the bottle gives the maker as "The Chas. H. Phillips Chemical Company" - but the Jacob Ruppert beer bottle led me to an entire essay on BeerNexus.com. Turns out that up until Prohibition, this was one of the greatest beer companies in NY, and the son of the founder, who took over the business from his father, bought the New York Yankees in 1914. Fun to find out that this really is a bit of local history. Here's the entrance to the marsh on Ruffle Bar, a favorite high-water destination. Back on the south side of the island - liked the skies (excellent "god-rays" going down) and the ripples on the sand. We blew home in half an hour. Good fun! So that took care of smelling of saltwater. The next day I took care of the dirt. Now if I just had one more day for spring cleaning it would be beyond perfect. Ah well, can't have everything. Circulating on Facebook this afternoon. Love it! Myself, I plan to smell like dirt, salt water, or possibly both before the weekend runs itself out. The Air Is Warm But The Water's Still COLD. Be Careful Out There, OK? Hate to go from all the floral frivolity & hot movie buzz to dead-freakin'-serious without so much as a trip report to ease people back into the Frogma-as-boating-blog concept like this, but cripes, it's that time of year again - the stories of totally avoidable Spring boating tragedies are starting to turn up all over the internet. Time for the annual Spring safety squawk. I'm late this year, in fact, but better late than never. The weather has been beautiful, but folks, please take the time to educate yourself about cold-water boating safety before you pull the boat out of winter storage. Air temperatures may be in the 60's and even 70's, but here in NYC, our water temperatures are still hovering around 50, which is cold enough to do a great deal of damage in a fairly short amount of time should you have the misfortune to end up in there without being prepared. The nice folks at USCG Auxiliary Norwalk just posted a link to a new Coast Guard press release on the subject today; also, I still have my Off-Season/Cold Water Boating Safety Sites link list right at the top of the sidebar (see it? just over to the right, by my Facebook link?) and it won't sink back down to the bottom of the list for at least another month or so. Great time of year to be on the water, I plan to get out there myself this weekend, looks like nice weather, highs around 60. I'll be wearing my drysuit anyways. Cooling off is easy, it's warming up that's hard. Well. Wow. I got to see it tonight. Lionsgate has been holding previews this week and tonight was the first of 2 Scholastic previews. It's too late to start in on a proper review, but I will repeat something I'd put up on Facebook. It goes off on a bit of a tangent, but I was responding both to queries from friends who wanted to know what I thought, and then to a very specific comment from Dan Kim, who really enjoyed the trilogy and was concerned (as are many who liked the books) about whether the transition to the screen was a good one, saying "Have fun...let us know what you think of how well executed the movie is... so many movies don't live up to the books they're based on. :-D "
The movie was excellent. First thing I said to my friendDiane (who joined me tonight and kindly offered tissues at appropriate moments) as the credits began to roll was "I don't think I've ever been quite so exhausted at the end of a movie". Thinking back now, Crouching Tiger Hidden Dragon, one of my all time favorite movies & the one I probably saw the most times while it was in theaters, may have been close. But this was an excellent movie. I don't know if you knew this, but the odds were "ever" more in favor of The Hunger Games making a good transition to the screen than most. You see, Suzanne Collins was a professional screenwriter long before she began writing for Scholastic. She gave a great talk at Scholastic a few years ago, and it was fun listening to her talk about how it was making the transition from screenwriter to novelist. She said the hardest thing was learning to write description - in the movies, what things and people end up looking like is the job of the designers of sets, props, and costumes; a novelist holds the responsibilty for creating the entire world of the story - all of the people, and also all of the sights, sounds, smells, textures and tastes of that place. She honed that skill in her Gregor books (which I'm ashamed to say I've never read, must get my hands on Gregor the Overlander one of these days & see how I like it). Storytelling through dialogue, she already knew. So with The Hunger Games, you have a professional screenwriter writing a highly cinematic novel, and then handling the screenwriting for the movie. BTW, I know that there's a lot of discussion out there of the appropriateness of both the books and this new movie for young people - the basic plot description does sound pretty awful, and if I can ever organize my thoughts enough I do hope to produce some sort of post about why I was so taken by them (I don't know if I'll be able to dignify it with the title of "review", but I'd like to give it a shot -- but for now, well, the one I went to tonight was one of a number of previews that were going on this week. Professional film critic and actual, real-live mom Thelma Adams attended one on Monday night, and I really liked what she had to say over on The Reel Breakdown. That was BIG, and very lovely, but we also enjoyed the entries that were smaller-scale, but still very beautiful environments. I think this one was actually my favorite, even though it was also the one that was probably the least in need of a "Do Not Enter The Exhibit" Sign, at least as far as I was concerned. People think "Hawaii" and they think lush and green, but for every place that catches the rain and grows wild with ferns and ginger and orchids, there's a place that's dry, with the red dirt showing. This exhibit was called Keahiakawelo, The Garden of the Gods", and it was inspired by the place of the same name on the island of Lanai. The place itself is actually famous for having an eerie desert beauty, with no vegetation at all; this Philadelphia Flower Show version is considerably softened by the grasses, but this way it reminds me of scenery that I think I remember from childhood visits to the Big Island (and that red cinder is the exact same stone as my parents used for a lot of the landscaping in front of the house - used to try to toughen up my "haole feet" by walking on it barefoot! :D). I was happy to see a lot of very large silver trophies on display in this one. Duuuude...margaritas, or mojitos, or maybe a nice cold Longboard Lager here, right? but less teasingly tempting to the footsore flower-viewer, as getting into them would be a bit of a squeeze. We absolutely loved these little dioramas. One amazing part is that this being a flower show, any greenery that isn't painted on the backdrop is actual live plants! There's Mandy again, for scale. EEEK! Murder in the Bishop Museum! All of these had judges' comments posted, and one of the things that the judges were real sticklers about was scale - any little plant or flower that wasn't on a believable scale to the scene got points off. I think this one got good marks for that, the main comment was "tilted display case is a distraction". I could never judge something like that - I'd be going "But there's actual Hawaiian plant lore on the posters!!!" I was actually glad to discover that the focus on this picture was good enough that when I zoomed in, I could read almost all of them -- there was quite a line to view these and I actually really WANTED to read those displays, but you just couldn't take all the time you wanted to to look at all the details without being annoying to the people behind you (a lady had done that to Mandy & me earlier, somehow didn't seem to understand that those of us in line behind her were actually interested in seeing the one she was monopolizing, told us we should just go ahead and go around her to the next one, argh - we never did get much of a look at that one). I suspected those were some well-researched placards, and I think I was right. Very, very cool.